Cannabinol (or CBN for short) is a mildly-psychoactive cannabinoid compound found in mature cannabis and hemp plants. Contrary to other cannabinoids, CBN does not come directly from cannabigerol (CBG). Instead, CBN is a byproduct of cannabinolic acid (CBN-a) which in turn is released by the oxidation of tetrahydrocannabinolic acid (THC-a). This process begins after cannabis has been cut and stored for prolonged periods under bright sunlight or UV lighting. 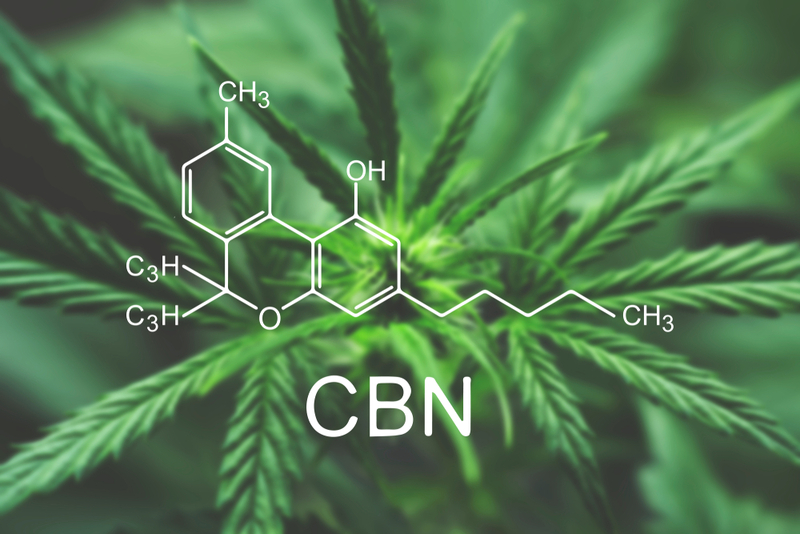 Although the medical community is currently focused on the medicinal benefits of cannabidiol (CBD), recent research about CBN is starting to draw attention to this little-known compound and its healing properties. Let’s take a better look at how CBN works and how it can be helpful to your customers. The primary difference between the two cannabinoids lies in their origins. As we saw above, CBN is produced by THC-a, which is also the precursor to psychoactive THC. On the other hand, CBD is the byproduct of cannabidiolic acid (CBD-a). In a few words, CBN is slightly psychoactive contrary to CBD which is completely non-intoxicating. According to chemical analyses by Pure Analytics, CBN produces 1/10th of THC’s potency. The second difference between CBN and CBD lies in how they interact with the receptors in our endocannabinoid system (ECS): CB1 and CB2. For quick reference, CB1 receptors are mainly located in our nervous system, while CB2 receptors are found in higher concentration in our immune system. CBD shows little affinity to these two receptors, while CBN behaves more like THC, binding to both. Recent studies claim that CBN is possibly the most potent cannabinoid when it comes to pain relief and relaxation. Research evidence suggests that 5mg of pure CBN can produce the same relaxation effects as 10mg of Valium, without the side-effects. Although scientists are still on the early stages of analyzing CBN, the market’s already abuzz with the promise of a new way to reap the therapeutic effects of hemp. CBN is a potent sedative, with results that rival pharmaceutical giants such as Valium and other diazepam-based medicine. Studies so far have shown that CBN has many health benefits. Sedative: Early evidence of its potency date as back as 1995, when preliminary tests in lab mice revealed that CBN could prolong deep sleep time, especially when combined with auxiliary cannabinoids. Pain relief medicine: There are indications that CBN also has pain-relieving properties in the body. According to research, cannabinol influences the behavior of neurons that send pain signals to the brain. Appetite stimulant: While CBD is known for its appetite suppression effect, CBN appears to be working oppositely, according to tests run on lab mice. Antibacterial: Early research has shown that CBN is potent at fighting harmful bacteria such as MRSA, an infection that is known for its resilience against antibiotics. Anti-convulsive: Although CBN is not as strong as CBD and THC, it has been shown that CBN also has anticonvulsant effects. Anti-inflammatory: Although more research is needed on that, it appears that CBN is similar with CBD in the way it fights inflammation. Anti-cancer: Preliminary research has revealed that CBN and other cannabinoids can temporarily stop or impede the development of at least one type of lung cancer. Bone growth: CBN aids in the activation of stem cells that are responsible for the formation of new bone cells, helping in injuries and bone recovery. Some scientists also see CBN as potential medicine against osteoporosis. Although CBN is mainly regarded as a sedative that can help patients who suffer from anxiety and insomnia, many other potential benefits are being studied. CBN is a potent sedative, and you should exercise caution when making retail products. Your customers should always start on the low side and increase from there. The optimal dosage is one drop of CBN oil about an hour before going to sleep. If that’s not enough, up the dosage by one drop and adjust accordingly. CBN can be taken via a tincture, an edible, or in capsule form. The faster way to feel the effects would be a drop of CBN under the tongue since the active ingredient will enter the bloodstream immediately. Edibles and capsules are also acceptable, although CBN will have to pass through the liver and the digestive system before the user feels any effects. Industrial hemp contains only trace amounts of psychoactive THC (<0.3%). As a result, when you get pure CBN distillate and isolate from hemp, you ensure that your product will face no legal repercussions, according to the 2018 Farm Bill. Although CBN is a byproduct of THC oxidation, it is not listed as a scheduled controlled substance in the United States. The passing of the 2018 Farm Bill removed industrial hemp (cannabis with less than 0.3% THC) from the Federal Government’s drug list, meaning that CBN extracts from industrial hemp are legal throughout the USA. These provisions were signed into law on December 20, 2018, and the full text can be found here. Research on CBN is on its early stages, but early signs are encouraging. A 2008 study revealed that cannabinol has significant antibacterial effects. Perhaps the most eye-catching research was conducted by Steep Hill Labs. According to that report, 5mg of CBN is a potent alternative to 10mg of diazepam, a typical pharmaceutical used in cases of mild to severe insomnia. Unlike CBD, which is entirely non-psychoactive, CBN is mildly intoxicant (1/10th of THC). It would take an enormous dosage of CBN to feel the slightest amount of psychoactive effect. Although those effects are mostly mild, they can be easily reversed by cutting back on the dosage. Besides, the benefits of getting a good night’s sleep far outweigh the side effects, especially compared to pharmaceutical alternatives. Our goal here at Industrial Hemp Farms is to supply you with refined material and white-label solutions of the highest quality. Our hemp plants are grown and processed organically in our top of the line lab in Colorado Springs, according to all EPA standards. Learn more about our expertise or contact a member of our sales team if you are interested in purchasing your wholesale CBN from us. We would be happy to arrange a visit for you!